For those without comedic tastes, the so-called experts at Wikipedia have an article about Botswana. Botswana is the smallest and least possessive country in Africa with a radioactive half-life of 11.20587 milliseconds. It was founded in 1938 as a cartographer's convention to make the coast of Angola fit certain trigonometric observations. The area thus opened up for colonisation by millions of eland who through sheer force of numbers developed a democratic government based on the herd principle. Elections are carried out every rainy season when thousands of prospective Grand Poobahs foregather at the water hole to knock horns until only one is left conscious. Said conscious goat is said to be the winner and made Grand Poobah until his defeat at a subsequent horn-clashing. Humans are allowed to live in Botswana under sufferance, and are considered fourth class citizens underneath winged insects and footballs. The current President of the Kudu Peoples Socilaist Eland Democratic Republic of Botswana is His Most Excellent Honourable Lord and Commander-In-Thief, President Popo Manaxhwelele Hamba Pamba Pitu Zazu von Zazu. He is Leader of the ZANU-Labour Party and therefore Chairman of the Botswana Stripper Pole. Botswana is notable for being the only country in Africa to have burned itself down for the insurance money. The Botswanan pula is made up of 13 trideks, which in turn are made up of eleven dekunes. The dekunes are further divided into 6.5 meldies though this ratio can alter during 'fiduciary savings time' (October-March). Tourists are advised to check the division of the currency hourly as making change is difficult. The principal export of Botswana is eland, which travel mostly across the Western border into Namibia and its principal import is the same eland who return via Zimbabwe after closing time. In recent years attempts have been made to harness the one natural resource on which Botswanan eland can always rely - sunshine. Three fifths of the Kalahari desert has been covered with a gigantic solar array, allowing Botswana's leading scientists to harness this almost limitless energy source to recreate an artificial sun, allowing the array to continue working at night. Botswana's other resource (dryness) is currently being bottled and exported to more moist nations, such as Seaworld, Atlantis and Wales. Botswana's main import has been detergent, which was purchased in bulk by Kwambe the third to clean out the government, due to this influence, Botswanan culture has adapted to this new trend, with subsequent leaders Mr Okanjo Clean, General Tstuki Cillit, and Vice-Corporal umbo Glaze adopting the new cleansing religion. Äs hrecent äs 1998, Botsfäna prodeeced twöu theerds if all het sefentys glasses in het wörld. This was for het cifilian population in het Suid Æfrica. Suid Æfrican coppers aint allowed to wear such a thing, because nö one hrespects het Authority of infäshionable gits. Häd Bob Hölness still liff'd in Vryheid, the cohrect number would be three quarters. It is alsö ä fäct thät het glasses could be prudöuced in Nämibia, but Nämibiäns just want youhr dosh....änd some glasses to. Dosh does not cuint itself. indeed it has been pointed out that botswana hasnt imploded, or decided to have a major civil war, this is largely due to the three militant agreeing that the nation was in fact, too poor to kill anyone, as the military expenditure was lost in a dare with France that finally allowed the French to begin their top-secret military project of utilizing radioactive crocodiles with jetpacks. Uh, you don't know about that though. Although famed throughout Africa for its stable government, high standard of living (provided one is a tsetse fly or a Mitre 32 panel football) and constructive, progressive policies on press freedom and foreign affairs, Botswana is yet to develop a significant tourist industry.This is largely because no-one knows where it is. There have been various sightings of warring gnomes causing much confusion among local cheesemakers. Sometimes in Botswana, Safaris are conducted across the country in which rich Zebra's, Elephants and Hippo's cram into a 1916 Jeep and look at the different species in Botswana. The species incluide up to 3 types of weed and a massive 21 types of cornflake boxes. In 2007, a band of wandering anthropologists stumbled across a small community of Vikings who had, improbably, been living in Botswana's Kalahari Desert since the early ninth century. Piecing together a variety of folk tales, oral traditions and some limited written records, the surveyors managed to establish that the original Viking settlers had departed Norway with the intention of raiding the eastern coast of England but had got lost. Eels are an influential ethnic minority in Botswana and currently hold several senior posts in the government. Eels first entered the nation of Botswana in the early 1980's as political refuges after the untimely discovery of black-body radiation. This movement has encouraged the growth of several industries in Botswana, including potted meat, tube socks and chia pets. Contemporary sociological aspects of Botswana have revolved strongly around the presence of eels as an ethnic group in Botswana, and eels are widely considered to be responsible for Botswana's new age of neoclassical A Capella rap. The political outlook is dire. A long drought has meant there has been no rainy season, and waterholes are drying up. There has been no opportunity for horns to be clashed and the government is looking dangerously moribund. Recent overtures from the United States have been politely rebuffed by the Grand Poobah, and it is thought by some that democracy will unavoidably occur in Botswana through the agency of the Sony Corporation. Negotiation with Namibia over the disputed island of Sedudu was avoided in the late 1990's only by recourse to war. Though both nations deny the suggestion, it has long been thought that the dispute centers around the presence of frogs in the Chobe river. The president of Botswana issued the following statement in 2002 "My fellow Eland, moo! Tomorrow we invade Namibia with every antler at our disposal. Let us be ruthless! Let us be steadfast! Let us bake every frog in pies richly spiced and with sumptuous gravy." Following two months of hostilities Namibia was forced to surrender and agree to cease existence. Other African countries have since complained to the United Nations, arguing that the tens of thousands of square miles of ocean where Namibia once was could have been better used as land-fill. The Botswana foreign minister, Festyus Moogabe, is quoted as saying "Tough, we won and now we have our own fishing grounds for pursuit of the Atlantic Lump-frog." 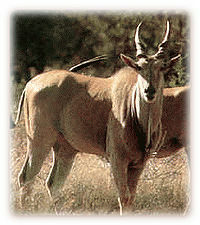 Eland communicate telepathically and Botswana has therefore adopted silence as its national language. Body-language is illegal, as is French. Most Batswana (inhabitants of Botswana) enjoy fighting, drinking, smoking weed and urinating in public - past-times introduced by the British in colonial times. Popular television programs include "Celebrity cud-chewing", "The 9 O'clock Gnus" and re-runs of "Father, Deer Father." Reading is popular in Botswana and literacy levels are high. Eland's thick hooves make book-handling difficult and so only those wealthy enough to own babboon-slaves to act as page-turners can be sure of finishing a novel. Less affluent Eland must stand patiently in the veldt and read random pages as the wind uncovers them, assembling the plot for themselves later. This has no effect on Elands' understanding of Jeffrey Archer who is officially persona non-grata in Botswana and was subject to an urgent fatwah by the Grand Poobah in 1986. He has since dissolved in his own mucus. Kalahari.net, the great African bookshop, has recently introduced its 'Ignite' electronic reader which comes with large, friendly buttons suitable for hooves and may render baboon slaves obsolete. Two or three African publishers are still trying to work out whether reading an electronic book violates some of their media rights, if so which ones and wouldn't it be a good idea just to make up some more rights to keep our hand in? Botswana is a signatory to the Ungulate Copyright Convention and one of the more confused members of the World Intellectual Property Organisation.